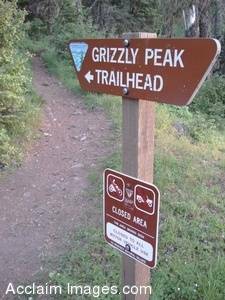 Description: Stock Photo of The Grizzly Peak Trailhead Sign located in Ashland Oregon. This photograph was taken in June of 2006 at the beginning of Grizzle Peak. You may license this image as stock photography or purchase it as an art print or a poster.